Apricot Sheer Top. Size S/M. Polyester. Sheer white with coloured butterflies. Elbow length wide sleeves. 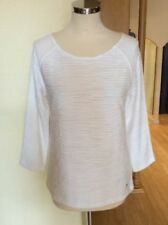 Hand wash.
Ladies Monsoon Top Size L. Condition is Used. Dispatched with Royal Mail 2nd Class. White Stuff Top, Size 12, Olive Green with Navy & White spots, 3/4 Sleeves, Good Condition. Jersey material, 100% cotton. Length from nape to hem 23”, sleeve length from underarm to hem 11” Dispatched with Royal Mail 2nd Class. 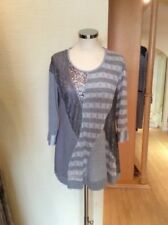 Joules Harbour Top Size 12. Condition is Used. Dispatched with Royal Mail 2nd Class Letter. Fantastic top, in a great condition. All our items come from a smoke and pet free home. Please feel free to ask any questions. Thanks for looking!!!! 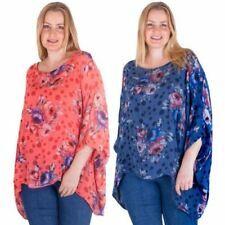 Wallis Multi Print Top XL. Condition is Used. Dispatched with Royal Mail 1st Class. Beautiful butterfly print blouse. BNWT. size 14. Condition is New with tags. Dispatched with Royal Mail 2nd Class. A pretty, thigh length top made of very stretchy material with a wide elasticated neckline, wide cuffs and loose bottom. In excellent condition. Any questions please ask. Bidders from outside Europe please email me for postage costs. Fat face peach colour cardigan with inbuilt cream camisole. Size 10 but would fit 12. Used but good condition. Great for spring days with jeans. Green Floral Tunic Large. 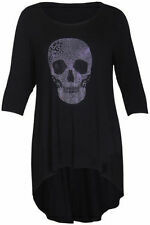 Long length Tunic with tie at waist/hip. Quite sheer material. Buttons at neck. Elasticated cuffs to sleeves. In excellent used condition, from a pet and smoke free home. Uk postage only. No returns. Please pay within 48!hours of winning bid. W ould fit size 16-18. L oo ks g re at o ve r wh it e le gg in gs o r sk in ny j ea ns. G oo d co nd it io n.
Lovely light cotton tunic from Per Una in white with pretty floral print. This tunic is good condition with plenty of wear left.